Tehilla had her vitals taken and screamed and cried. She finally card down and we went to play in the gymboree while waiting for her appointment. The appointment went very well. She freaked out when we entered the room but I was able to sooth her and she saw that our surgeon wasn't going to hurt her. Dr. Erez was happy to hear how Tehilla was doing and said that the little bit of fluids that she had when discharged now sounds like it is all gone. Because Tehilla is so active and doing so well they are not overly concerned with her heart rate right now. Her oxygen saturation was 91!!!!! We have never seen such a high number for her. Her heart rate was in the 70s which is still not great. 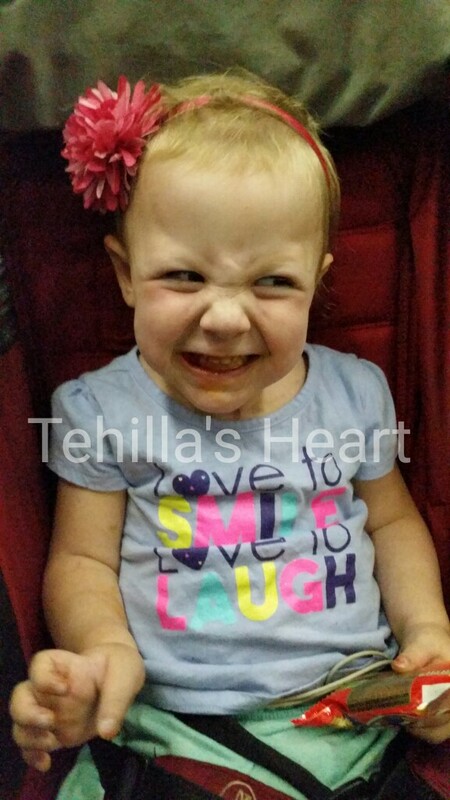 Tehilla goes home with the Holter monitor and we return it to them tomorrow. We see our cardiologist next week for an echo and to hear the results of the Holter monitor and the outcome. The time to pray is now. Pray that her Holter comes back with clear answers. Tehilla is now happily earing her M&Ms that she was promised. I am so happy that she is doing so well. I will trust HaShem her Holter Moniter readings will come out well. All praises be to Him. Hahaha! You're cute Tehilla! I like your expression! We are all happy to hear your speddy recovery! Cola cavod!HaShem!